While I'm not *quite* ready yet to reveal the title and subject of my next historical novel, the painting shown here will offer clues galore. This is a view of Wall Street in New York City around 1797, between the modern Water and Front Streets, in what is now the heart of the Financial District. All of which makes this painting of the New York, (above, with details below; click to enlarge), that my characters would have known especially useful to me. This street corner would have been familiar to Eliza and Alexander Hamilton in I, Eliza Hamilton, and it's equally well-known to my new characters, too. The scale of 18thc New York may bear little resemblance to the towering skyscrapers of today, but the city's legendary intensity is already present. Every person (and even the dog in the lower left) seems filled with energy and purpose as the Stars and Stripes snaps and flutters in breeze. At this time, Wall Street led directly to the waterfront and the East River wharves, the source of much of the city's wealth and power. 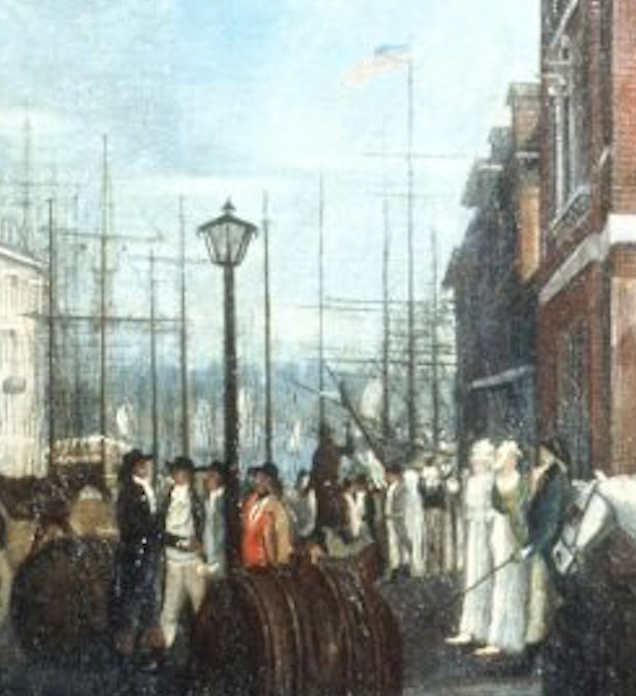 Those tall masts at the end of the street must have been a constant reminder that New York was a flourishing international port, sending ships not only to Europe, but to destinations in Africa, South America, and the faraway Pacific. The cargo in these ships included coffee, sugar, and tea, silk, cotton, and linen, fine furnishings and silver. It could also include enslaved men, women, and children, for slavery was still legal in New York, and many households and businesses, large and small, relied on enslaved workers. 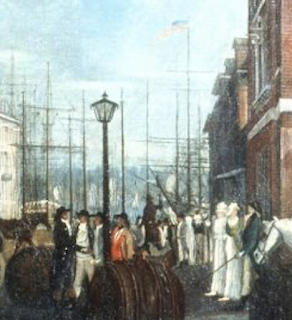 Coffee houses played an important role in 18thc New York, and two of the most notable appear in this painting. 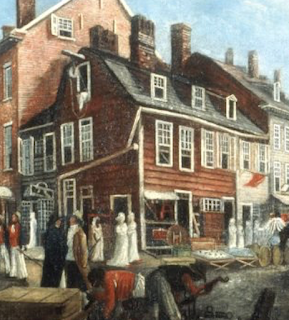 The small clapboard building on the corner with the gambrel roof is the Merchants' Coffee House, one of the gathering-places for political discussions during the Revolution, and later, during the 1780s, the site of the creation and organization of the Bank of New York. 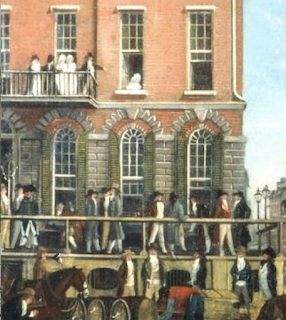 Across the street and nearly out of the left side of the painting is the Tontine Coffee House. 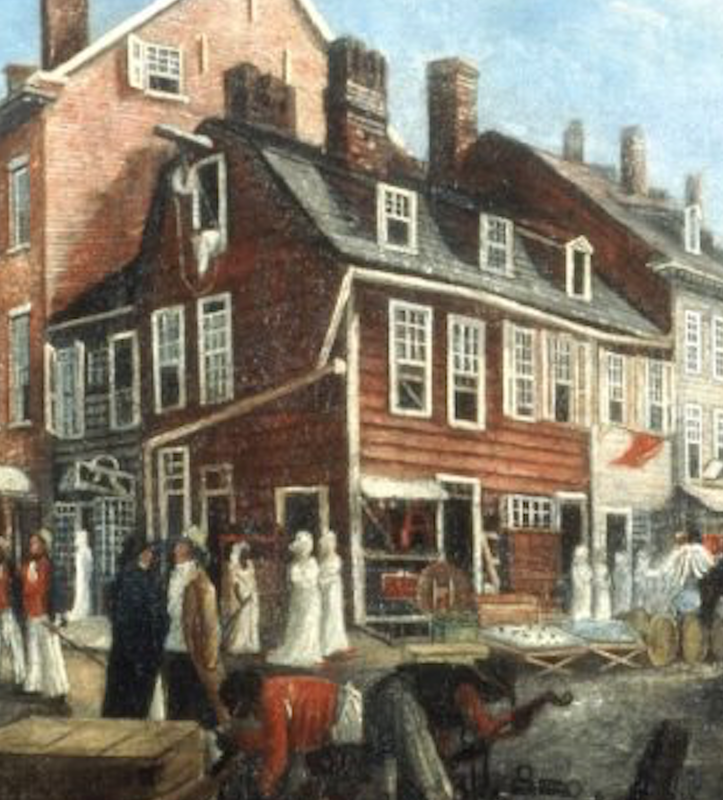 This was the first home of the New York Stock Exchange, and of merchant activity of every kind. 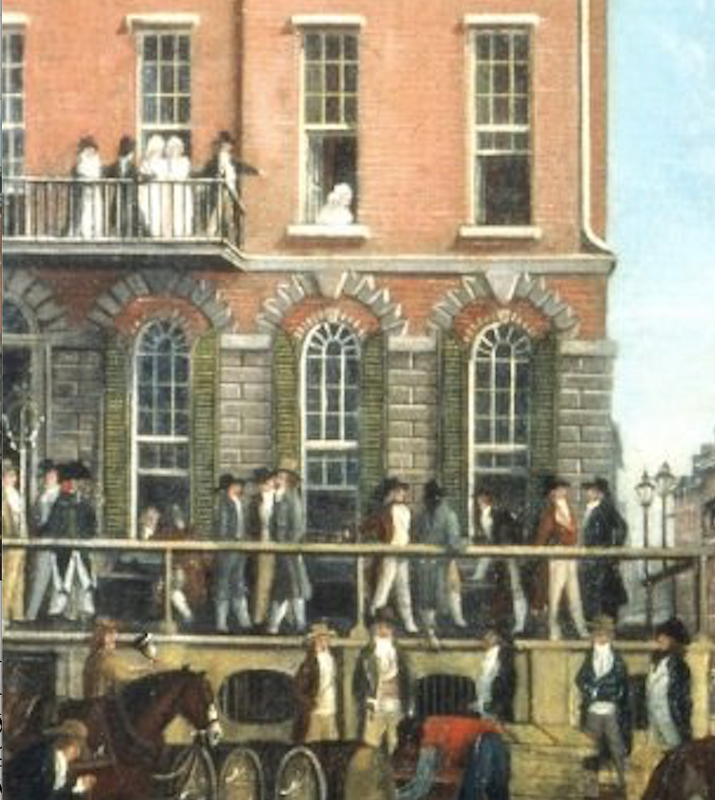 "The Tontine coffee-house was filled with underwriters, brokers, merchants, traders and politicians; selling, purchasing, trafficking, or insuring; some reading, others eagerly inquiring the news. The steps and balcony of the coffee-house were crowded with people bidding, or listening to several auctioneers....Every thing was in motion; all was life, bustle, and activity....Every thought, word, look, and action of the multitude seemed to be absorbed by commerce...and all were eager in the pursuit of its riches." 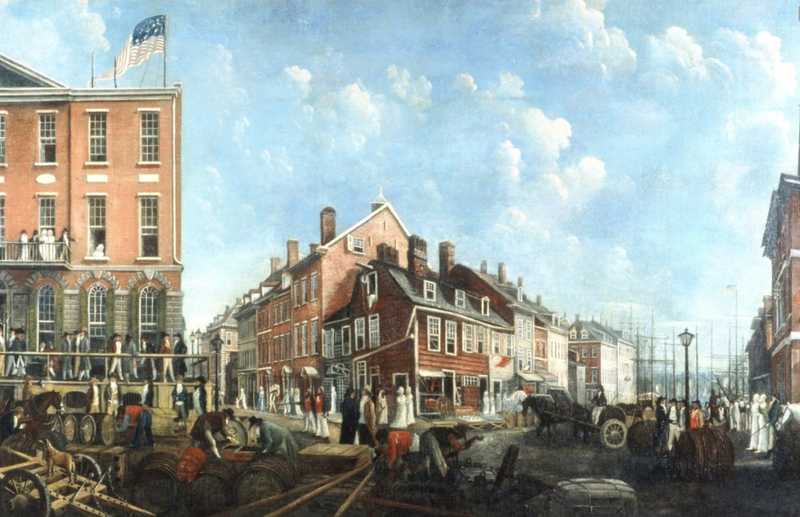 Above: Tontine Coffee House, New York City by Francis Guy, c1797, New-York Historical Society. While it is not the metropolis of New York, "Falmouth, Massachusetts," now known as Portland and the rest of the State of Maine, offers a lot of ways to look at colonial and early US history. Seeing this post I cannot help but expound upon the extant history and "everyday anthropology" found here in the very wood of the many old buildings still standing. One of my faves us the Tate House Museum in Stroudwater, next to the airport, and continuing on to the Longfellow House and Maine Historical Society downtown. At the time, Maine was a source of important goods, including masts and I think molasses and rum, and a thriving deep water port. It is mentioned in the Declaration of Independence because of the Royal Navy's early attack of the town. A cannonball still resides at the first Parish UU church. It was probably geographically as large at the Island of Manhattan but less densely populated. The Bowdoin College Museum and the Portland Art Museum have good collections of early art, and portraits by limners. When I was last in NY my husband and I tried to find some Dutch colonial buildings and were told that none were left. We have a lot of old buildings up here and a lack of skyscrapers. I think the lives of women were probably much the same all over the early US and with the same dangers from childbirth and fever. Mary Tate, of the above mentioned Tate House, died when she triggered a trap she had her son set up to catch a thief. I wonder if NY had a ship observatory tower as we do in Portland where runners would wait for the call to tell their masters that "Their ship had come in." Ours still stands. We also have, in nearby Cape Elizabeth, what I believe is the first light house commissioned by George Washington. Of course the Hudson Valley probably also has as much wondrous history. What a wonderful article. I loved your Eliza Hamilton book, can't wait for the new one. I too love historic paintings that give a view of a place and time; yet I can't help noticing in this one that, except for two gentleman who appear to be unpacking a box in the lower left, every other person doing manual labor is black: the whites, who are by far the majority, are almost all standing in conversation with each other, though one is driving a conveyance of some sort. There's no bustle, either, as you might expect from a London scene, such as van Haecken's depiction of Billingsgate in 1736. Granted, it's a small section of only one corner in a wharf area, but I find it oddly sterile--and given the fact that white men also (historically) occupied lower class laboring positions, rather unbalanced in its representation. Awesome! Great post and great image - I know that area well. 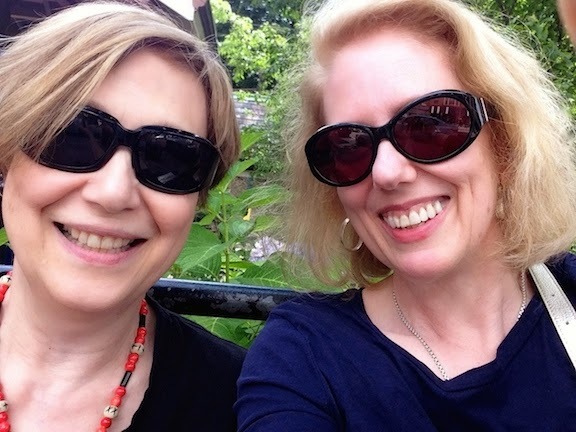 Can't wait for more news about your book...and for the book release. Exciting times. I believe that as one looks down Wall Street one sees both Front Street and beyond that South Street where the ships are.